Singer introduced the Freearm 222K in July, 1953. This model set a new standard that may never be matched again. This particular machine is equipped with the original case, manual and attachments. Hinges and latches are in excellent working order. Solid case, lining intact. This little lovely was produced in the first production when Singer began to scale back production of the Featherweight. The elegant black-banded badge was introduced following the Singer centennial year in 1951 and persisted throughout the decade. This 1956 production run of Black-Banded badges contains at most 5000 units. 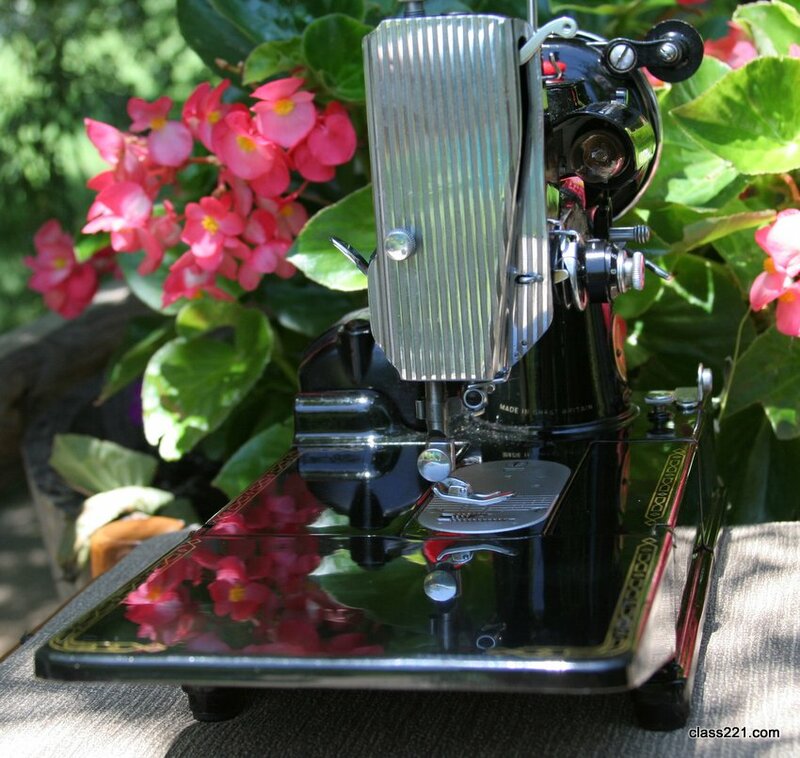 The Singer 222K sat atop of a rapidly evolving sewing world in September of 1956. Five years later, cheap Asian imports would mark the end of the Featherweight. Timing set, tension adjusted, and sew tested. It has been exceptionally well cared for. This machine runs very smoothly. Stitches are neat and tight. Machine is equipped with a 110 volt motor. Foot pedal and power cord are in good working order. This late 222K is equipped with a red plastic side case tray. This machine has acquired small scratches just beyond the needle plate where fabric pulls across the bed, and a couple of small scratches on the extension bed. Nothing else keeps this machine from scoring 50 out of 50. Select “Buy Now” to Place Machine on LayAway or Make Monthly Payments. Sorry, this item has been placed on layaway. 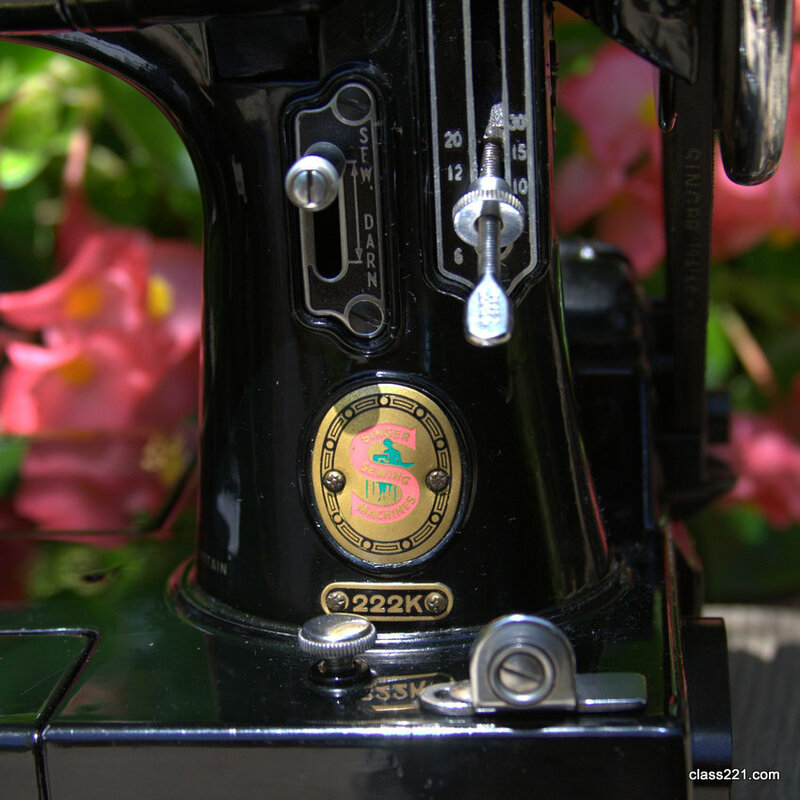 Having introduced the Freearm Featherweight in 1953, Singer was starting to ramp up production of these machines by August of 1955 when this machine was made. Even at that, only 10,000 serial numbers were reserved for this production run. Cheaply made inexpensive foreign competition deeply affected Singer in the late 1950’s. By 1961 the Featherweight 222K Freearm, arguably Singer’s greatest accomplishment, was removed from production. This particular Singer Freearm 222K is uncommonly smooth. It is equipped with the original case, manual and attachments. The extension bed has a few scratches, indicative of light, regular use. Considering this is a 60 year old machine, it would be fair to call her “perfect.” But make no mistake, this is no antique. 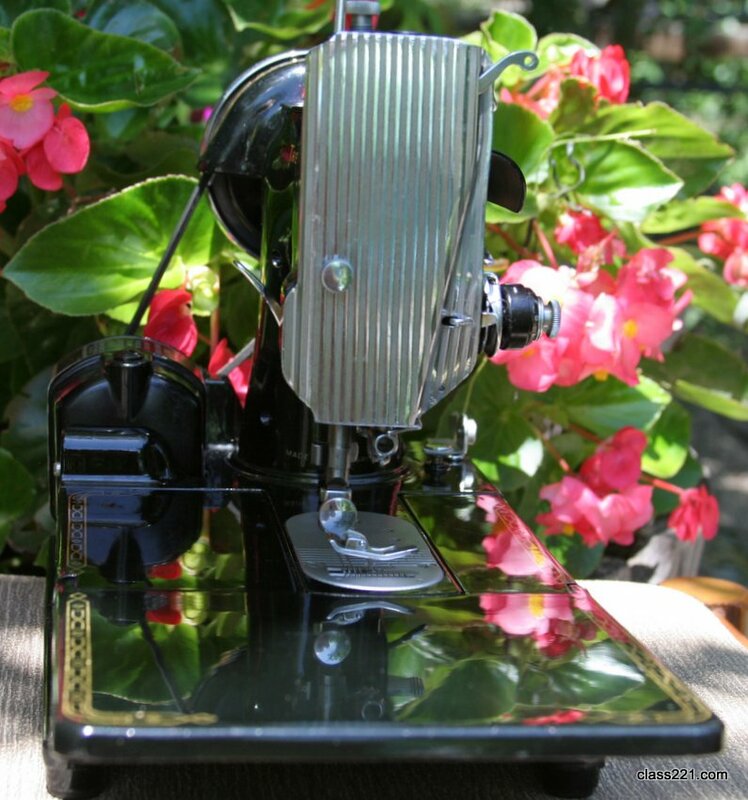 This is a sewing machine completely prepared for many more years of service. Case hinges and latches are in excellent working order. The machine has been exceptionally well cared for and runs very smoothly. Machine is equipped with a 110 volt motor. Foot pedal and power cord are in good working order. Removable bed slides easily on and off. The original manual is a bit tattered, as usual for 222 manuals, but usable. The early 222K case is equipped with a black, steel side tray. Select “Buy Now” to Place Machine on Lay Away on Make Monthly Payments at the End of Each Successive Month.